It's a better stab at Monaco than Valencia have managed. Looks good. Another circuit by the sea. Are there deck chairs for hire? No. The Germans have already fully booked them. Wow, Bernie's really pushing the envelope. The circuit will have 18 corners with 5000 meters to extension. In the simulators the average lap is 1m33s with 193 Km/h of average. In the end of the principal straight, located on the North Breakwater and in the course to de sea, the cars will break 321 Km/h. Where will be the pit lane entrance/exit anyway ? There is a perfectly good circuit in San Luis! 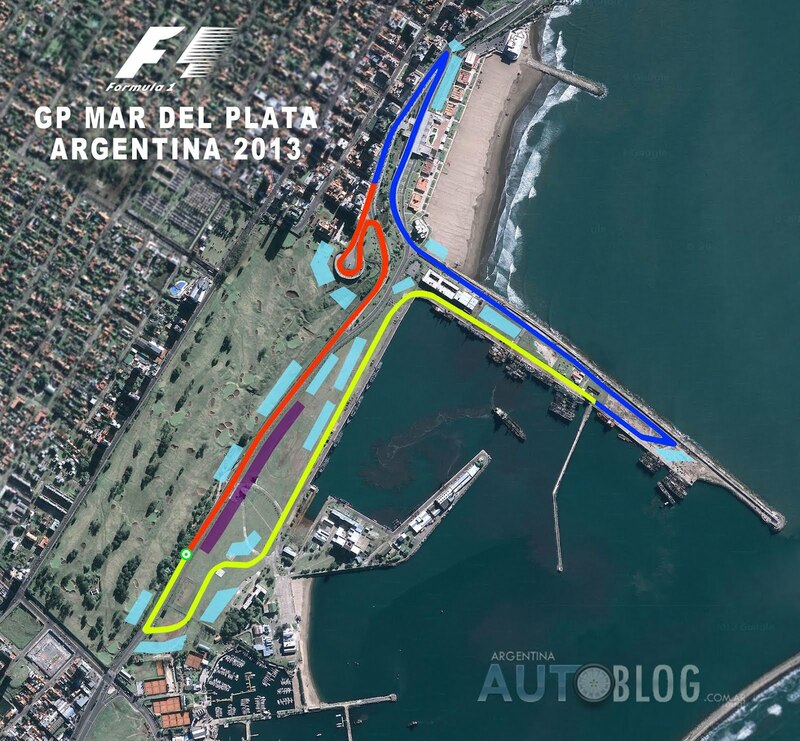 If I could choose one site into the Argentine to organize a GP, this would be Mar del Plata, because the city is very beautiful, with nice beachs, a very beautiful coastal avenue with ups and downs, and of course a big hotel infraestructure and international airport. Mar del Plata have near 1 000 000 of people and receive 3 000 000 of tourist all years in January and February, the summer in this part of the globe. By importance and number of people (14 000 000) the GP should be in Buenos Aires, but this city has no natural beauty and I very happy that Mar del Plata is the city elected. But the realy reason because Buenos Aires was not chosen is that the governor of the city is a political party opposed to the national government. Our national government (in my opinion, the worst of the history) only makes things for their own interesting and do not import if this is good for the country. San Luis is 800 Km from Buenos Aires, It is a very beautiful place. The local Governor did a fantastic circuit in Potrero de los Funes, but this province has only 431000 people and has not the necessary infrastructure to receive the GP. Also the local Governor is a political party opposed to the national government too. Then is impossible that the GP will be race here. I hope you can understand only speak basic english. Last edited by hondafan37; 17 Mar 2012 at 15:58. The pit building is the purple rectangle, but I do not know how the pit lane will be.